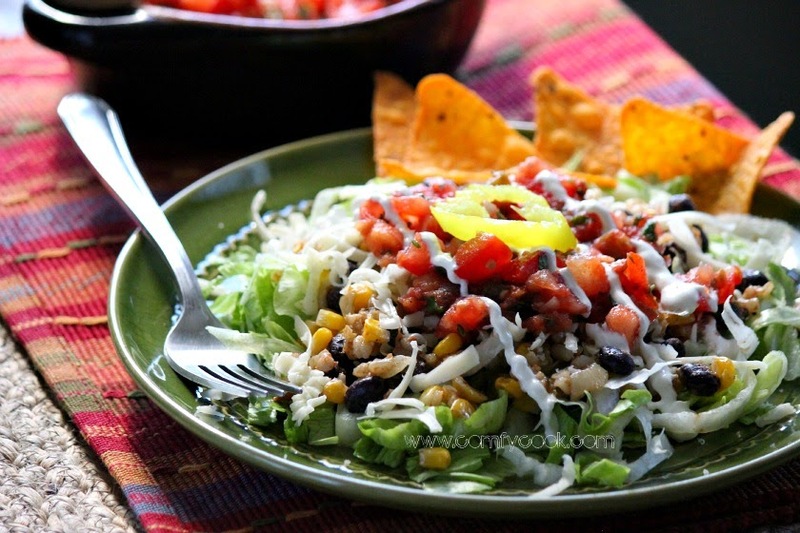 Nobody will miss the meat in this taco salad. The rice and beans can be made ahead and just reheated slightly before serving. I love the combination of crispy, cold lettuce with the warm bean mixture. Semi-homemade salsa really makes this dish! Heat oil in a large non-stick skillet over medium heat. Add onion and corn, stirring until the onion begins to brown, about 5 minutes. Coarsely chop 1 tomato. Add it to the pan along with the rice, beans, chili powder, cumin, oregano and salt. Cook, stirring frequently until the tomato cooks down, about 5 minutes. Let cool slightly. Coarsely chop the remaining 3 tomatoes. Combine with cilantro, salsa, and lime juice in a medium bowl. Arrange lettuce on your serving dish. Top with bean mixture, cheese and salsa. Serve with tortilla chips of your choice. This looks amazing! I love taco salad.